So, we’re getting ready to embark on Season 2. A year ago, we were talking about Season 1. How do you feel right now? 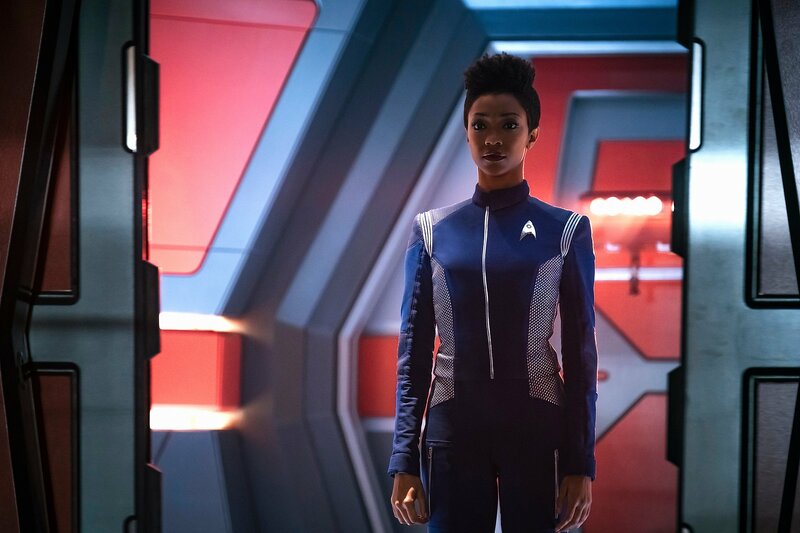 SONEQUA MARTIN-GREEN: It’s such a different experience now, isn’t it? Because, last year we were talking about what it was going to be. And now we can talk about what it is. People have seen it now, so you can have conversations that are much more in depth, much more excavating. People have seen the story and they know who we are and what we’re trying to do, and what we struggle with, and all of that. It’s always great when you can have, sort of, a “post” conversation about something that has been shared. So that’s how it feels. And the love and the support is really, really powerful. And humbling. The way you finished the first season, when the Enterprise arrives, everyone is expecting a crossover. MARTIN-GREEN: Right. Well, where you ended with us is right where you’ll pick us up, face to face with the USS Enterprise. So, there is crossover there. I mean, there’s crossover already with Pike bring on the ship now, and now you know Spock is definitely coming, so there’s crossover there. And I’m not sure if you mentioned Picard, but that is going to be its own thing. They’re doing something very special with that. I mean, we hope that there’s crossover with that, but nothing’s been said so far. So you’re saying that Sir Patrick hasn’t come to the set yet? MARTIN-GREEN: Sonequa’s gonna say that I would love for him to come. Could you briefly describe the importance of your character’s name? MARTIN-GREEN: Oh, I love talking about this. From the very beginning, Bryan Fuller, who created the show with Alex Kurtzman, wanted to continue on with a style of his, which is giving his female leads male names. It’s just a stylistic choice of his. So they wanted to support that, and continue with that. But there was also mention of the archangel Michael in the writer’s room, when developing the character. Then, once I came on board, I had to create it for myself, and I created (and that’s now the way that is is) that I was named after my father. And it’s a subtle yet poignant political statement, if you will, that things are a little more open in the future, and a girl can be named after her dad. And I know that that’s the case for some people today, which is amazing – or a son named after his mother. That we aren’t so black and white about labels and names and all that good stuff. I love that my name is Michael and I’m essentially Michael Burnham Jr.
MARTIN-GREEN: Absolutely. It really knocks you off your feet, because you have an idea of what this kind of representation can do, you know how powerful it is – especially as a black woman, I know what it was like growing up not really having it, or having it only in one way, only one-dimensionally. But to have a black woman like this, who is powerful, who is vulnerable, who is effective, who is a genius, who is a servant. I can only imagine how that might affect a young girl, especially a young girl of color, especially a young black girl, young black boys, young boys of color… To see it actually happen, though. It’s another thing all together to actually hear somebody say it to you. Or to see them write it, have them send it to you, or just a beautiful conversation. It’s another thing all together, and then it just knocks you back. It makes you cry. In the panel, it was mentioned that Burnham and Spock haven’t connected for some length of time. What can you tell us about the relationship between Spock and Burnham? Can you tell us how that might be explored or what you knew about it when the season’s story was beginning? MARTIN-GREEN: I knew quite a bit about it toward the end of Season 1, and definitely coming into Season 2. I had created a lot on my own, and then things were really rounded out for me. It is a very complicated relationship. What’s beautiful is that it’s explored in a very courageous way. It’s explored in a way that is not easy. It’s explored in a way that is very ugly, but very true, and very raw. And also very beautiful. I know people aren’t going to expect just how complicated our relationship is. Where do we find Burnham’s relationship with Tyler going forward? On the panel, you spoke about how Star Trek isn’t just about utopia, but about the struggle that it takes to reach that point. Could you speak to that a little bit more? MARTIN-GREEN: We all like to look at this pictures of utopias, right? Because they’re very calming and comforting and encouraging. But what I love about Star Trek Discovery is that you see how hard it is to maintain it. That’s what we need to know today. We need to know today that it will take everything we have. It’s uncomfortable, and it’s difficult, and it’s inconvenient. But it’s necessary. And it’s daily. And it’s moment to moment. It’s a call to arms, love being the ultimate weapon. For me, it’s very much like living like Jesus. You get in there and you love no matter what, and you fight to be equal, and all of that. Pike, Spock – No pressure. How does it feel to be jumping into those roles? ETHAN PECK: I said it three times yesterday. It’s so surreal. The amount of work that goes into creating these sets that are utter masterpieces, the costumes, the attention to detail is just unparalleled in my opinion. MOUNT: It’s six sound stages. Were you big Star Trek fans before getting these roles? MOUNT: That was our go-to make-believe game when I was 8 years old, was Star Trek. We’d take turns with who would get to play Kirk and Spock. Nobody wanted to play Pike? MOUNT: Well, Pike only really existed in flashback… Nobody knew “The Cage” because YouTube didn’t exist. We’ve seen the melding of the uniforms we know from 1966 with the Discovery uniforms in Pike’s. 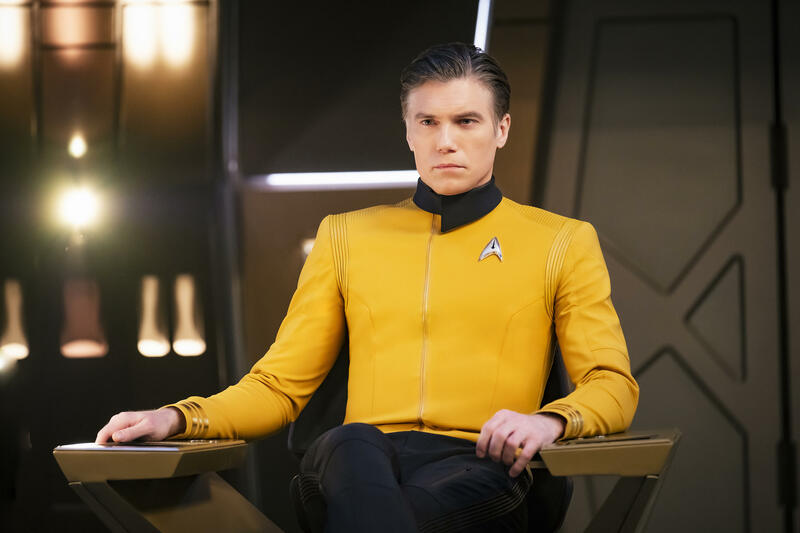 Do we get to see that same sort of amalgamation of styles in the interiors of the Enterprise? Ethan, you have some pretty big shoes to fill as Spock, and you’re the first one we see in the timeline. How did you react to your casting? PECK: I was totally shocked. Something that’s kind of tortured me is “Am I worthy of this?” This is such an amazing opportunity. But apparently they thought I was. So I’m doing my absolute best and damnedest. What happened to your social media when they announced that you’d be playing Spock? PECK: I got some followers. A few thousand followers. It was pretty wild. Ethan, did you say you were a Star Trek fan growing up? PECK: Yeah! And I just worked with Jonathan Frakes. And my childhood Star Trek content was First Contact and I was just like, “Wow! That’s full circle.” But I’m a big science fiction fan in general, and I’m becoming a very big Trek fan, obviously. 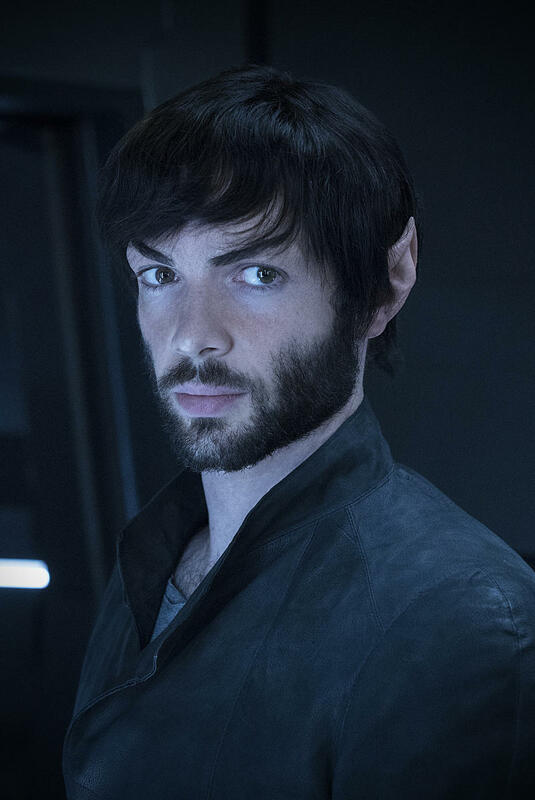 With this being the youngest we’ve seen Spock since “The Cage,” did you try to emulate any of Leonard Nimoy’s performance or anything that Zachary Quinto’s done in the more recent films? PECK: Yeah! Nimoy, specifically. I definitely tried to internalize what I saw on screen, and what he’s doing. There’s a musicality to his voice, the way he speaks. I definitely tried to capture the spirit, and then transpose it onto the material I’ve been given. Which is very different… you never see Spock go beneath the surface very much, but this season of Discovery, you will. What’s one of your favorite things about portraying this character at this age and at this point in the timeline? PECK: The freedom to invent his past. Emotionally and logically. Did you take your ears from the first day of shooting? PECK: No, but I wanted to! You can’t take anything back, because it’s all super confidential. There’s actually a cork board in the prosthetics trailer with every set of ears. Is there anything you can tell us about Spock’s relationship with Burnham, or what’s explored this season? PECK: That it’s very complex. And not in the most easy way. What can you tell us about the relationship between Spock and Pike? In the Original Series, Spock risks his career to save Pike after he’s injured, so how might that show itself in Discovery? MOUNT: There’s a moment in the first episode of the season where I’m talking to Burnham. She has questions about where Spock is. And I mention a little bit about what he’s going through, and at a certain point, she asked me what it’s all about. And I say, “He didn’t want to talk to me.” And that – there’s so much packed into that one line. He did want to share with me, rather than “I ordered him to and he ignored it” or “He didn’t come to my office.” There’s a real friendship at work. PECK: And I think that illuminates the dignity of Spock, to sort of hide his shame from someone he respects and admires. Later this week, we’ll have more from the cast – Including Anthony Rapp, Wilson Cruz, Mary Wiseman, Doug Jones, Mary Chieffo, and Shazad Latif.